Tom Lister’s acting career was started by Jimmy Bridges (brother of actor Todd Bridges)…. Tom “Tiny” Lister Jr. had a brief stint in the National Basketball Association (NBA)…. Zeus was the arch-rival of Hulk Hogan‘s character “Rip” in 1989’s “No Holds Barred”…. ~~~As a cross-promotional tool for the film, Zeus & Hogan’s feud carried over into WWF storylines..
April 25, 1989 – in Des Moines, Iowa – SNME: Zeus makes his WWF debut..
~~~Zeus attacked Hulk Hogan prior to Hulk Hogan’s cage match against Big Bossman..
July 18, 1989 – in Worcester: Zeus’ run-in caused Randy Savage to lose to Beefcake by DQ..
~~~Hulk Hogan ran in next, but was unable to put down Zeus – even after two chair shots…. August 9, 1989 – in Fresno: Zeus managed Randy Savage to a loss against Hulk Hoganl..
~~~~After the match, Zeus put Hulk Hogan in a bearhug – but was double slammed by Hulk & Beefcake..
August 28, 1989 – SummerSlam: Hogan & Brutus Beefcake defeated Zeus & ‘Macho King’ Randy Savage..
September 21, 1989 – in Cincinnati: Zeus managed Ted DiBiase to a loss against Hulk Hogan..
November 1, 1989 – in Wichita: Zeus attacked Demolition Smash, causing him to lose to Ted DiBiase..
November 23, 1989 – Survivor Series: The Hulkamaniacs (Ax, Hulk Hogan, Jake Roberts & Smash) defeated The Million Dollar Team (Ted DiBiase, The Barbarian, The Warlord & Zeus) in a tag team elimination match. December 12, 1989 – “NHB” The Match,The Movie in Nashville at Municipal Auditorium: Brutus Beefcake & Hulk Hogan defeated Randy Savage & Zeus. 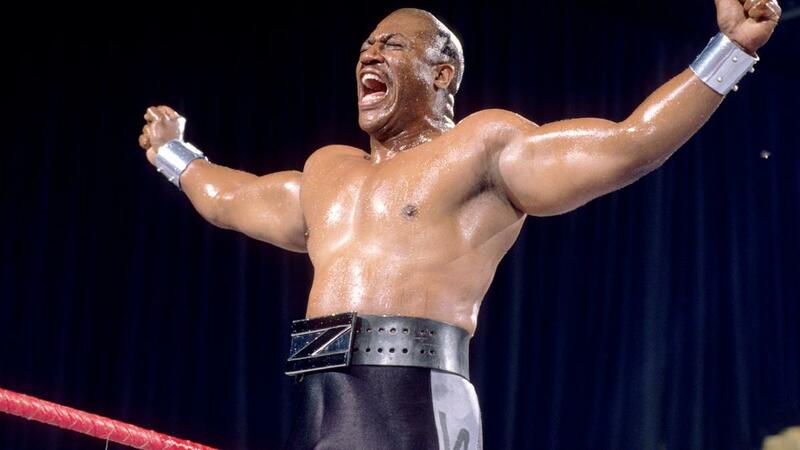 July 7, 1990 – WWC 17th Anniversary Show: Zeus defeated Abdullah The Butcher by count-out. March 24, 1996 – WCW Uncensored: The Mega Powers (Hulk Hogan & Randy Savage) defeated The Alliance To End Hulkamania (Arn Anderson, Kevin Sullivan, Lex Luger, Meng, Ric Flair, The Barbarian, The Ultimate Solution & Ze Gangsta) in a doomsday cage match. ~~~as (what is arguably his most famous role) ‘Deebo’ in “Friday” and “Next Friday”…. Tommy “Tiny” Lister also played the president of earth in the movie “the fifth element”. December 1, 2006: Tommy “Tiny” Lister was a guest of Trinity broadcasting’s program “Praise The Lord” hosted by Sting..
~~~Lister talked about his life growing up in Compton and gave an stirring testimony that was both powerful and emotional..
2006: Tommy “Tiny” Lister appeared in the Rap-Video “Ridin'” by Chamillionaire.